Happy Friday!! I'm so happy this day has finally rolled around, especially because I thought all day YESTERDAY was Friday. Isn't that the worst?! We don't have a ton of plans for the weekend besides attending our friend Eddie's annual St. Patrick's Day party, where he kicks us all out of his house by two pm so he can go see a traditional Irish band play. Don't worry, we're invited to see the band too ;) I'm just always so amused by a party that ends by two! 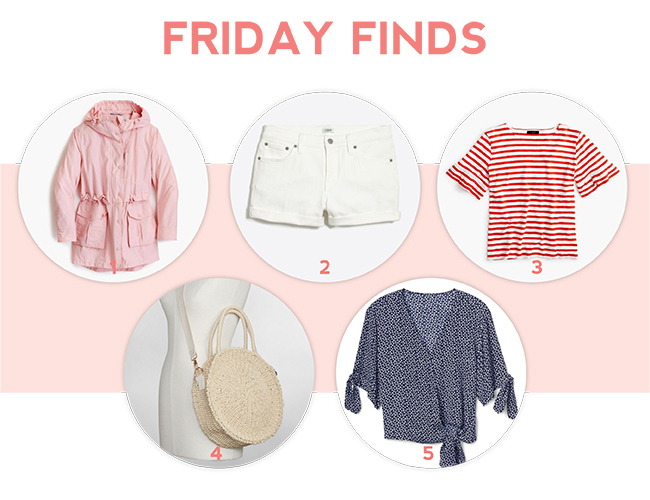 Below are my finds for the week, including my favorite white shorts that are back in stock! These are the only white shorts I've worn for probably four years now. Mine are starting to look a little dingy, so I'm thinking it may be time for a new pair. I also find this super cute Clare V dupe in case you've had an eye on my bag but are looking for something more budget friendly. Just a note - this is the bigger size, so don't expect it to be little like mine!